Wahl 79524-3001 Home Barber 30 Piece Kit includes multi-cut clipper, blade guard, cordless touch-up trimmer, blade guard, personal trimmer with 2 heads, mirror, spray bottle, medium comb, barber comb, cape, 2 hair clips, scissors, cleaning brush, blade oil, soft storage case, left and right ear trim guide combs, eyebrow trime guide comb, ear trim guide comb, 12 guide combs. Whether you're looking for a new look or you want to fine-tune a trim for precise detail, the Home Barber Kit provides you with three products to cover all your bases. The multi-cut clipper can easily cut thick hair with 35 percent more power than standard motor clippers. 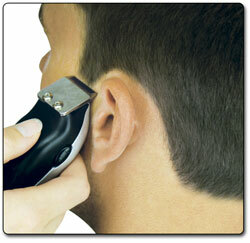 For detailing around the ears or on the neckline, the touch-up trimmer provides a clean edge wherever you need it. The personal trimmer features two detachable heads--a rotating head that's ideal for nose and ear hairs, and a reciprocating head that is great for shaping eyebrows without nicking or pulling. Made from precision-ground, high-carbon steel, the blades are designed to stay sharp for a long period--no more frustration with dull blades. You can achieve a precise edge with these durable, high-quality blades. 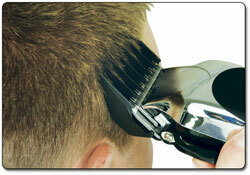 The clipper and trimmers are ergonomically designed for a sure grip and complete maneuverability around the head. The Home Barber Kit includes everything you need to get started cutting and trimming hair in your home. The professional-quality tools include 12 guide combs from 1/8- to one-inch wide along with left- and right-ear tapers. An eyebrow and ear trim guide help you achieve the precise look you want every time. The kit includes a barber comb, styling comb, mirror, two hair clips, and professional-quality scissors so you can start cutting hair right away. Plus, the cleaning brush keeps the steel blades free from hair after each use and the clipper oil keeps the edges sharp. The blade guard provides protection from unwanted nicks and damage during storage.